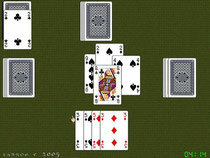 Twenty-Five could be considered the national card game of Ireland: it is played widely in rural pubs and at home. The game moves quite quickly - it does not take long to play a hand - and although there is a fair amount of luck in it, there is also some scope for skill. It is played here by four people. The ranking order of the cards may seem a little arcane at first, but with a little practice it becomes second nature. Apart from the scoring it is more or less the same as the old games of Maw and Spoil Five.